"AIG" redirects here. For other uses, see AIG (disambiguation). American International Group, Inc., also known as AIG, is an American multinational finance and insurance corporation with operations in more than 80 countries and jurisdictions. As of December 31, 2016[update], AIG companies employed 56,400 people. The company operates through three core businesses: General Insurance, Life & Retirement, and a standalone technology-enabled subsidiary. General Insurance includes Commercial, Personal Insurance, U.S. and International field operations. Life & Retirement includes Group Retirement, Individual Retirement, Life, and Institutional Markets. AIG's corporate headquarters are in New York City and the company also has offices around the world. AIG serves 87% of the Fortune Global 500 and 83% of the Forbes 2000. AIG was ranked 60th on the 2018 Fortune 500 list. According to the 2016 Forbes Global 2000 list, AIG is the 87th largest public company in the world. On December 31, 2017, AIG had $65.2 billion in shareholder equity. 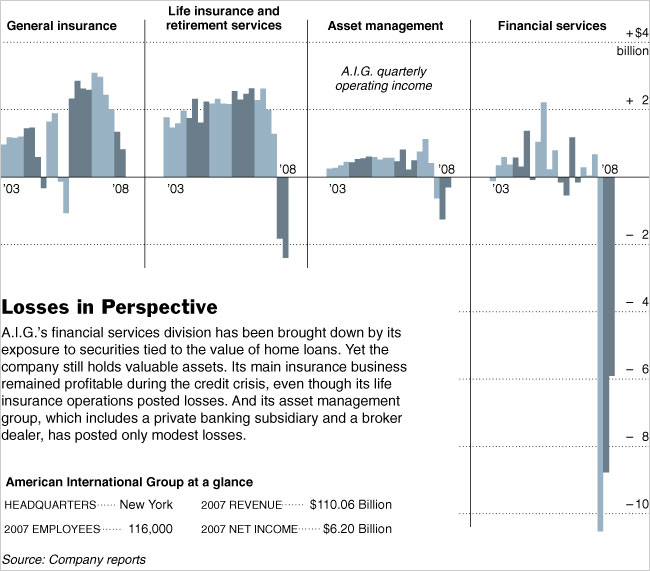 AIG was a central player in the financial crisis of 2008. It was bailed out by the federal government for $180 billion, and the government took control. The Financial Crisis Inquiry Commission (FCIC) of the US government concluded AIG failed primarily because it sold massive amounts of insurance without hedging its investment. Its enormous sales of credit default swaps were "made without putting up initial collateral, setting aside capital reserves, or hedging its exposure—a profound failure in corporate governance, particularly its risk-management practices." The US government sold off its shares after the crisis and completed the process in 2012. 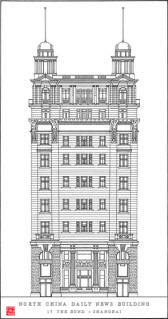 North China Daily News Building on the Bund, Shanghai (elevation): the original home of what became AIG; now the AIA building. 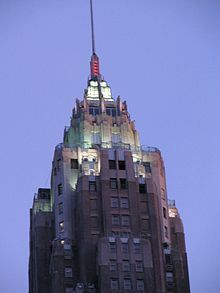 70 Pine Street was known as the American International Building. AIG was founded December 19, 1919 when American Cornelius Vander Starr (1892-1968) established a general insurance agency, American Asiatic Underwriters (AAU), in Shanghai, China. Business grew rapidly, and two years later, Starr formed a life insurance operation. By the late 1920s, AAU had branches throughout China and Southeast Asia, including the Philippines, Indonesia, and Malaysia. In 1926, Mr. Starr opened his first office in the United States, American International Underwriters Corporation (AIU). He also focused on opportunities in Latin America and, in the late 1930s, AIU entered Havana, Cuba. The steady growth of the Latin American agencies proved significant as it would offset the decline in business from Asia due to the impending World War II. In 1939, Mr. Starr moved his headquarters from Shanghai, China, to New York City. After World War II, American International Underwriters (AIU) entered Japan and Germany, to provide insurance for American military personnel. Throughout the late 1940s and early 1950s, AIU continued to expand in Europe, with offices opening in France, Italy, and the United Kingdom. In 1952, Mr. Starr began to focus on the American market by acquiring Globe & Rutgers Fire Insurance Company and its subsidiary, American Home Fire Assurance Company. By the end of the decade, C.V. Starr's general and life insurance organization included an extensive network of agents and offices in over 75 countries. In 1960, C.V. Starr hired Maurice R. Greenberg to develop an international accident and health business. Two years later, Mr. Greenberg reorganized one of C.V. Starr's U.S. holdings into a successful multiple line carrier. Greenberg focused on selling insurance through independent brokers rather than agents to eliminate agent salaries. Using brokers, AIU could price insurance according to its potential return even if it suffered decreased sales of certain products for great lengths of time with very little extra expense. In 1967, American International Group, Inc. (AIG) was incorporated as a unifying umbrella organization for most of C.V. Starr's general and life insurance businesses. In 1968, Starr named Greenberg his successor. The company went public in 1969. The 1970s presented many challenges for AIG as operations in the Middle East and Southeast Asia were curtailed or ceased altogether due to the changing political landscape. However, AIG continued to expand its markets by introducing specialized energy, transportation, and shipping products to serve the needs of niche industries. By 1979, with a growing workforce and a worldwide network of offices, AIG offered clients superior technical and risk management skills in an increasingly competitive marketplace. During the 1980s, AIG continued expanding its market distribution and worldwide network by offering a wide range of specialized products, including pollution liability and political risk. In 1984, AIG listed its shares on the New York Stock Exchange (NYSE). Throughout the 1990s, AIG developed new sources of income through diverse investments, including the acquisition of International Lease Finance Corporation (ILFC), a provider of leased aircraft to the airline industry. In 1992, AIG received the first foreign insurance license granted in over 40 years by the Chinese government. Within the U.S., AIG acquired SunAmerica Inc. a retirement savings company, in 1999. The AIG Towers of Woodland Hills, Los Angeles. The early 2000s saw a marked period of growth as AIG acquired American General Corporation, a leading domestic life insurance and annuities provider, and AIG entered new markets including India. In February 2000, AIG created a strategic advisory venture team with the Blackstone Group and Kissinger Associates "to provide financial advisory services to corporations seeking high level independent strategic advice." AIG was an investor in Blackstone from 1998 to March 2012, when it sold all of its shares in the company. Blackstone acted as an adviser for AIG during the 2007-2008 financial crisis. In March 2003 American General merged with Old Line Life Insurance Company. In the early 2000s, AIG made significant investments in Russia as the country recovered from its financial crisis. In July 2003, Maurice Greenberg met with Putin to discuss AIG's investments and improving U.S.-Russia economic ties, in anticipation of Putin's meeting with U.S. President George W. Bush later that year." In November 2004, AIG reached a US$126 million settlement with the U.S. Securities and Exchange Commission and the Justice Department partly resolving a number of regulatory matters, but the company must still cooperate with investigators continuing to probe the sale of a non-traditional insurance product. In 2005, AIG became embroiled in a series of fraud investigations conducted by the Securities and Exchange Commission, U.S. Justice Department, and New York State Attorney General's Office. Greenberg was ousted amid an accounting scandal in February 2005. The New York Attorney General's investigation led to a $1.6 billion fine for AIG and criminal charges for some of its executives. On May 1, 2005, investigations conducted by outside counsel at the request of AIG's Audit Committee and the consultation with AIG's independent auditors, PricewaterhouseCoopers LLP resulted in AIG's decision to restate its financial statements for the years ended December 31, 2003, 2002, 2001 and 2000, the quarters ended March 31, June 30 and September 30, 2004 and 2003 and the quarter ended December 31, 2003. On November 9, 2005, the company was said to have delayed its third-quarter earnings report because it had to restate earlier financial results, to correct accounting errors. Martin J. Sullivan became CEO of the company in 2005. He began his career at AIG as a clerk in its London office in 1970. AIG then took on tens of billions of dollars of risk associated with mortgages. It insured tens of billions of dollars of derivatives against default, but did not purchase reinsurance to hedge that risk. Secondly, it used collateral on deposit to buy mortgage-backed securities. When losses hit the mortgage market in 2007-2008, AIG had to pay out insurance claims and also replace the losses in its collateral accounts. AIG purchased the remaining 39% that it did not own of online auto insurance specialist 21st Century Insurance in 2007 for $749 million. With the failure of the parent company and the continuing recession in late 2008, AIG rebranded its insurance unit to 21st Century Insurance. On June 11, 2008, three stockholders, collectively owning 4% of the outstanding stock of AIG, delivered a letter to the Board of Directors of AIG seeking to oust CEO Martin Sullivan and make certain other management and Board of Directors changes. This letter was the latest volley in what The Wall Street Journal called a "public spat" between the company's board and management, on the one hand, and its key stockholders, and former CEO Maurice Greenberg on the other hand. On June 15, 2008, after disclosure of financial losses and subsequent to a falling stock price, Sullivan resigned and was replaced by Robert B. Willumstad, Chairman of the AIG Board of Directors since 2006. Willumstad was forced by the US government to step down and was replaced by Ed Liddy on September 17, 2008. AIG's board of directors named Bob Benmosche CEO on August 3, 2009, to replace Mr. Liddy, who earlier in the year announced his retirement. In late 2008, the federal government bailed out AIG for $180 billion, and technically assumed control, because some believed its failure would endanger the financial integrity of other major firms that were its trading partners--Goldman Sachs, Morgan Stanley, Bank of America and Merrill Lynch (as well as dozens of European banks), as described below. In January 2011, the Financial Crisis Inquiry Commission issued one of many critical governmental reports, deciding that AIG failed and was rescued by the government primarily because its enormous sales of credit default swaps were made without putting up the initial collateral, setting aside capital reserves, or hedging its exposure, which one analyst considered a profound failure in corporate governance, particularly its risk management practices. Other analysts believed AIG's failure was possible because of the sweeping deregulation of over-the-counter (OTC) derivatives, including credit default swaps, which effectively eliminated federal and state regulation of these products, including capital and margin requirements that would have lessened the likelihood of AIG's failure. AIG had sold credit protection through its London unit in the form of credit default swaps (CDSs) on collateralized debt obligations (CDOs) but by 2008, they had declined in value. AIG's Financial Products division, headed by Joseph Cassano in London, had entered into credit default swaps to insure $441 billion worth of securities originally rated AAA. Of those securities, $57.8 billion were structured debt securities backed by subprime loans. As a result, AIG's credit rating was downgraded and it was required to post additional collateral with its trading counter-parties, leading to a liquidity crisis that began on September 16, 2008, and essentially bankrupted all of AIG. The New York United States Federal Reserve Bank (led by Timothy Geithner who would later become Treasury secretary) stepped in, announcing creation of a secured credit facility, initially of up to US$85 billion to prevent the company's collapse, enabling AIG to deliver additional collateral to its credit default swap trading partners. The credit facility was secured by the stock in AIG-owned subsidiaries in the form of warrants for a 79.9% equity stake in the company and the right to suspend dividends to previously issued common and preferred stock. The AIG board accepted the terms of the Federal Reserve rescue package that same day, making it the largest government bailout of a private company in U.S. history. On March 17, 2009, AIG compounded public cynicism concerning the "too big to fail" firm's bailout by announcing that it would pay its executives over $165 million in executive bonuses. Total bonuses for the financial unit could reach $450 million, and bonuses for the entire company could reach $1.2 billion. Newly installed President Barack Obama, who had voted for TARP as a Senator responded to the planned payments by saying "[I]t's hard to understand how derivative traders at AIG warranted any bonuses, much less $165 million in extra pay. How do they justify this outrage to the taxpayers who are keeping the company afloat?" Both Democratic and Republican politicians reacted with similar outrage to the planned bonuses, as did political commentators and journalists in the AIG bonus payments controversy. AIG began selling some assets to pay off its government loans in September 2008 despite a global decline in the valuation of insurance businesses, and the weakening financial condition of potential bidders. In December 2009, AIG formed international life insurance subsidiaries, American International Assurance Company, Limited (AIA) and American Life Insurance Company (ALICO) which were transferred to the Federal Reserve Bank of New York to reduce its debt by US$25 billion. AIG sold its Hartford Steam Boiler unit on March 31, 2009, to Munich Re for $742 million. On April 16, 2009, AIG announced plans to sell 21st Century Insurance subsidiary to Farmers Insurance Group for $1.9 billion. June 10, 2009. AIG sold down its majority ownership of reinsurer Transatlantic Re. The Wall Street Journal reported on September 7, 2009, that Pacific Century Group had agreed to pay $500 million for a part of AIG's asset management business, and that they also expected to pay an additional $200 million to AIG in carried interest and other payments linked to future performance of the business. AIG then sold its American Life Insurance Co. (ALICO) to MetLife Inc. for $15.5 billion in cash and MetLife stock in March 2010. Bloomberg L.P. reported on March 29, 2010, that after almost three months of delays, AIG had completed the $500 million sale of a portion of its asset management business, branded PineBridge Investments, to the Asia-based Pacific Century Group. Fortress Investment Group purchased 80% of the interest in financing company American General Finance in August 2010. In September AIG sold AIG Starr and AIG Edison, two of its Japan-based companies, to Prudential Financial for $4.2 billion in cash and $600 million in assumption of third party AIG debt by Prudential. On November 1, 2010, AIG raised $36.71 billion from both the sale of ALICO and its IPO of AIA. Proceeds went to pay off FRB of New York loan. AIG sold its Taiwanese life insurance company Nan Shan Life to a consortium of buyers for $2.16 billion in January 2011. Due to the Q3 2011 net loss widening, on November 3, 2011, AIG shares plunged 49 percent year to date. The insurer's board approved a share buyback of as much as $1 billion. Nine years after the initial bailout, in 2017, the U.S. Financial Stability Oversight Council removed AIG from its list of too-big-to-fail institutions. The United States Department of the Treasury announced an offering of 188.5 million shares of AIG for a total of $5.8 billion on May 7, 2012. The sale reduced Treasury's stake in AIG to 61 percent, from 70 percent before the transaction. Four months later, on September 6, 2012, AIG sold $2 billion of its investment in AIA to repay government loans. The board also approved a $5 billion stock repurchase of government-owned shares in AIA. The next week, on September 14, 2012, the Department of Treasury completed its fifth sale of AIG common stock, with proceeds of approximately $20.7 billion, reducing the Treasury's ownership stake in AIG to approximately 15.9 percent from 53 percent. Government commitments were fully recovered, and Treasury and the FRBNY to date had received a combined positive return of approximately $15.1 billion. On October 12, 2012 AIG announced a five and a half year agreement to sponsor six New Zealand-based rugby teams, including world champion All Blacks. The AIG logo and the Adidas logo, the league's primary sponsor, will be displayed on the league's team jerseys. The U.S. Department of the Treasury in December 2012 published an itemized list of the loans, stock purchases, special purpose vehicles (SPVs) and other investments engaged in with AIG, the amount AIG paid back and the positive return on the loans and investments to the government. The Treasury said that it and the Federal Reserve Bank of New York provided a total $182.3 billion to AIG, which paid back a total $205 billion, for a total positive return, or profit, to the government of $22.7 billion. In addition, AIG sold off a number of its own assets to raise money to pay back the government. On December 14, 2012, the Treasury Department sold the last of its AIG stock in its sixth stock stale for a total of approximately $7.6 billion. In total, the Treasury Department realized a gain of more than $22 billion from the sale of AIG common stock and $0.9 billion from the sale of AIG preferred stock. The same month, Robert Benmosche announced that he would be stepping down from his position as President and CEO due to his advancing lung cancer. AIG began an advertising campaign on January 1, 2013, called "Thank You America," in which several company employees, including AIG President and CEO Robert Benmosche, talked directly to the camera and offered their thanks for the government assistance. Peter Hancock succeeded Benmosche as President and CEO of AIG in September 2014. While Benmosche stayed on in an advisory role, he passed away in February the following year. In June 2015, Taiwan's Nan Shan Life Insurance acquired a stake in AIG's subsidiary in Taiwan for a fee of $158 million. Later that year, activist investor Carl Icahn called for a breakup of AIG, describing the company as "too big to succeed." AIG announced plans for an initial public offering of 19.9 percent of United Guaranty Corp., a Greensboro, North Carolina-based provider of mortgage insurance for lenders in January 2016. Later that year, Icahn won a seat on the board of directors and continued to pressure the company to split up its major divisions. AIG also began a joint venture with Hamilton Insurance Group and Two Sigma Investments to serve the insurance needs of small- to medium-sized enterprises. Industry veteran Brian Duperreault became the chairman of the new entity, and Richard Friesenhahn, the executive vice president of U.S. casualty lines at AIG, became CEO. In August 2016, AIG sold off United Guaranty, its mortgage-guarantee unit, to Arch Capital Group, a Bermuda-based insurer, for $3.4 billion. Brian Duperreault was appointed CEO of AIG on May 15, 2017. That September, the company reorganized into three segments, comprising a general insurance unit, a life and retirement unit, and a stand-alone technology-focused unit called Blackboard Insurance, led by Seraina Macia. In Australia and China, AIG is identified as a large financial institution and provider of financial services including credit security mechanisms. In the United States, AIG is the largest underwriter of commercial and industrial insurance. AIG offers property casualty insurance, life insurance, retirement products, mortgage insurance and other financial services. In the third quarter of 2012, the global property-and-casualty insurance business, Chartis, was renamed AIG Property Casualty. SunAmerica, life-insurance and retirement-services division, was renamed AIG Life and Retirement, other existing brands continue to be used in certain geographies and market segments. Hank Greenberg, with lead lawyer David Boies, independently sued the U.S. Government for money damages in the United States Court of Federal Claims in 2011. The AIG board had announced on January 9 that the company would not join the lawsuit. After hearing thirty-seven days of testimony from Ben Bernanke, Timothy Geithner, Hank Paulson and others, Judge Thomas C. Wheeler ruled that the Federal Reserve payment to AIG had been an illegal exaction, as the Federal Reserve Act did not authorize the New York Fed to nationalize a corporation by owning its stock. Judge Wheeler did not award compensation to the plaintiffs, ruling that they did not suffer economic damage because "if the government had done nothing, the shareholders would have been left with 100 percent of nothing." Greenberg and the U.S. Government appealed to the Court of Appeals for the Federal Circuit, which ruled that Greenberg had no legal right to challenge the bailout because that right belonged to AIG, which in this case, chose not to sue. AIG filed suit against the New York Federal Reserve in January 2013 in order to maintain the former's right to sue Bank of America and other issuers of bad mortgage debt. The specific issue was whether the New York Federal Reserve transferred $18 billion in litigation claims on troubled mortgage debt through Maiden Lane Transactions, entities created by the Fed in 2008. This transaction, AIG argued, prevented them from recouping losses from insured banks. Owing to events which allowed AIG to proceed in another related case (see below), AIG withdrew the Maiden Lane case "without prejudice" on May 28, 2013. On May 7, 2013, Los Angeles U.S. District Judge, Mariana Pfaelzer, ruled in a case between AIG and Bank of America concerning possible misrepresentations by Merrill Lynch and Countrywide as to the quality of the mortgage portfolio, that $7.3 billion of the disputed claims had not been assigned. The two parties settled in July 2014, with Bank of America paying out $650 million to AIG, who in turn dismissed their litigation. Brian Duperreault – President and Chief Executive Officer, American International Group, Inc.
Peter R. Fischer - Former Head of Fixed Income Portfolio Management, Blackrock Inc.
Suzanne Nora Johnson – Former Vice Chairman, The Goldman Sachs Group, Inc.
^ a b "Cornelius Vander Starr 1892-1968" (PDF). p. 6. ^ "AIG and China: Could A "Special Relationship" Translate into Cash?". Time. September 18, 2008. Retrieved August 9, 2011. ^ "US SEC: Form 10-K American International Group, Inc". U.S. Securities and Exchange Commission. Retrieved February 16, 2018. ^ "2016 10-K American International Group, Inc" (PDF). AIG.com. UNITED STATES SECURITIES AND EXCHANGE COMMISSION. December 31, 2016. p. 8. Archived from the original (PDF) on March 29, 2017. Retrieved March 3, 2017. ^ a b c Barlyn, Suzanne; Singh, Sweta (2017). "AIG to restructure into three new units, marking CEO's first big move". Reuters. Retrieved September 25, 2017. ^ a b c Scism, Leslie (September 25, 2017). "AIG Retools Operating Structure Following Pledge From CEO". Wall Street Journal. Retrieved September 25, 2017. ^ a b "AIG Restructures Again; Commercial Lines CEO Schimek to Leave". Insurance Journal. September 25, 2017. Retrieved September 26, 2017. ^ "2016 10-K American International Group, Inc" (PDF). AIG.com. UNITED STATES SECURITIES AND EXCHANGE COMMISSION. December 31, 2016. p. 4. Retrieved March 3, 2017. ^ "Fortune 500". Fortune. Retrieved August 1, 2018. ^ "The World's Biggest Public Companies". Forbes. Retrieved March 15, 2017. ^ "SEC Filing American International Group, Inc. Annual Report Pursuant to Section 13 or 15 (d) of the Securities Exchange Act of 1934 For the fiscal year ended December 31, 2017". aig.gcs-web.com. Item 6. p. 35. ^ a b c Phil Angelides (2011). Financial Crisis Inquiry Report. DIANE Publishing. p. 352. ISBN 9781437980721. ^ a b "Treasury Sells Final Shares of AIG Common Stock, Positive Return on Overall AIG Commitment Reaches $22.7 Billion". Department of Treasury. Retrieved February 6, 2013. ^ a b c d Laing, Jonathan R. (July 8, 1991). "Are the Glory Years Over? – Much Slower Growth Seems in the Offing for AIG". Barron's. ^ Tracer, Zachary (December 18, 2012). "Benmosche Exits Greenberg Jewel Linked to AIG Founding". Bloomberg Businessweek. Retrieved February 21, 2013. ^ a b "AIG Europe – History". Marketline. February 18, 2004. ^ Bandler, James (October 7, 2008). "Hank's Last Stand". Fortune. Retrieved February 21, 2013. ^ "American International Group Inc (New York Stock Exchange)". Company profile. New York: Thomson Reuters. Archived from the original on February 20, 2009. Retrieved March 18, 2009. ^ "AIG: What does this US giant do?". BBC News. September 17, 2008. Archived from the original on March 20, 2009. Retrieved March 18, 2009. ^ "Foreign Office Files for China, 1949–1976". Part 1: Complete Files for 1949: Publisher's Note. Adam Matthew Publications. Archived from the original on October 13, 2008. Retrieved March 18, 2009. ^ "80 Years of Growth and Diversification; the AIG Story". Business Insurance. April 12, 1999. ^ Collins, Stuart (May 28, 2003). "Greenberg Hails London Role". Insurance Day. ^ a b c Ehrbar, Al (2006). Fallen Giant The Amazing Story of Hank Greenberg and the History of AIG. Hoboken, New Jersey: John Wiley & Sons, Inc. pp. 82–83 and 91. ISBN 0-471-91696-X. ^ "Greenberg Joining C.V. Starr & Co. in Development Capacity". Insurance Advocate. December 17, 1960. ^ Bowers, Barbara (August 1998). "Building a Global Platform". Best's Review/Life-Health Edition. ^ Hoover's Handbook of American Business (9th ed.). Austin, TX: Hoover's Business Press. 1999. p. 134. ISBN 978-1-57311-045-7. Retrieved March 18, 2009. ^ a b c d Cunningham, Lawrence A (2013). The AIG Story. Hoboken, New Jersey: John Wiley & Sons, Inc. pp. 14–15. ISBN 978-1-118-34587-0. ^ Barreto, Elzio (December 16, 2012). "AIG marks end of era with $6.45 billion AIA stake sale". Reuters. Retrieved March 7, 2013. ^ "AIG, SunAmerica to Merge on New Year's Day". AMBest. December 30, 1998. ^ "AIG Closes American General Acquisition". National Underwriter Life & Health. August 30, 2001. ^ "Tata-AIG to Kick off with IT Products". Business Line Internet Edition. February 11, 2001. ^ "AMERICAN INTERNATIONAL GROUP, INC., THE BLACKSTONE GROUP L.P. AND KISSINGER ASSOCIATES, INC. ANNOUNCE A NEW STRATEGIC ADVISORY VENTURE". ^ De La Merced, Michael J. (March 2, 2002). "A.I.G. Sheds Stake in Blackstone". New York Times DealBook. ^ "Do You Have An Old Line Life Insurance Policy?". www.rootfin.com. Retrieved December 28, 2017. ^ Semenenko, Igor (July 30, 2003). "AIG, Interros Set Up $500M Funds". The Moscow Times. Retrieved February 13, 2019. ^ "AIG Forks Up $126 million to SEC on PNC Deals". Insurance Journal. November 24, 2004. Archived from the original on August 29, 2008. Retrieved September 18, 2008. ^ "MSNBC". MSNBC. Archived from the original on June 28, 2011. Retrieved July 11, 2011. ^ Zuill, Lilla (March 3, 2009). "Reuters". Reuters. Retrieved July 11, 2011. ^ "AIG executive sentenced to 4 years in prison". The Seattle Times. Retrieved May 22, 2014. ^ "AIG Nears Completion of Internal Review; Will Restate Results Provides Update on Internal Review and Timing". ^ "AIG to Again Restates Previous Results". Archived from the original on November 5, 2013. ^ Andrews, Edmund L.; de la Merced, Michael J.; Williams Walsh, Mary (September 16, 2008). "Fed's $85 billion Loan Rescues Insurer". The New York Times. Archived from the original on April 30, 2011. Retrieved September 17, 2008. ^ "AIG buys 21st Century Insurance". Los Angeles Times. September 28, 2007. ^ "AIG rebrand US auto insurance unit 21st Century Insurance, and cut jobs". November 26, 2008. Archived from the original on December 20, 2008. Retrieved December 3, 2008. ^ "AIG Investors Seek Ouster of Chief Executive Sullivan". Bloomberg. June 11, 2008. Retrieved July 21, 2008. ^ Zuill, Lilla (December 30, 2008). "Former AIG CEO Willumstad foregoes some stock awards". New York: Thomson Reuters. Retrieved March 18, 2009. ^ Dennis, Brady (August 3, 2009). "The Washington Post, "AIG Names Robert Benmosche New President and CEO"". The Washington Post. Retrieved July 11, 2011. ^ Jerry M. Rosenberg (2012). The Concise Encyclopedia of The Great Recession 2007-2012. Scarecrow Press. p. 244. ISBN 9780810883406. ^ a b Morgenson, Gretchen (September 29, 2008). "Behind Insurer's Crisis, Blind Eye to a Web of Risk". The New York Times. Retrieved September 29, 2008. ^ Pittman, Mark (September 29, 2008). "Goldman, Merrill Collect Billions After Fed's AIG Bailout Loans". Bloomberg News. Retrieved October 12, 2008. ^ Andrews, Edmund L (September 16, 2008). "Fed's $85 billion Loan Rescues Insurer". The New York Times. Retrieved September 28, 2008. ^ Kaiser, Emily (September 17, 2008). "After AIG rescue, Fed may find more at its door". Reuters. Retrieved September 17, 2008. ^ "Federal Reserve Board, with full support of the Treasury Department, authorizes the Federal Reserve Bank of New York to lend up to $85 billion to the American International Group (AIG)". United States Federal Reserve Board of Governors. Retrieved September 16, 2008. ^ Schmidt, Krista (April 15, 2009). "History of U.S. Gov't Bailouts". Pro Publica. Archived from the original on December 27, 2014. Retrieved December 28, 2014. ^ Stein, Jerome (2012). "AIG in the Crisis". Stochastic Optimal Control and the U.S. Financial Debt Crisis. Springer Science & Business Media. p. 99. ISBN 9781461430797. Retrieved December 29, 2014. The AIG liquidity crisis led to the largest government bailout of a private company in US history, totaling $182 billion. ^ "U.S. Senate vote on Emergency Economic Stabilization Act of 2008". Senate.gov. June 29, 2011. Retrieved July 11, 2011. ^ "Obama tries to stop AIG bonuses: 'How do they justify this outrage?' - CNN.com". www.cnn.com. Retrieved April 17, 2017. ^ Bansal, Paritosh (February 24, 2009). "AIG may rethink asset sales in tough markets". Reuters UK. Archived from the original on February 28, 2009. Retrieved March 2, 2009. ^ Yvette Essen, Insurance Correspondent (December 22, 2008). "Munich Re buys AIG's Hartford Steam Boiler for $742m". Telegraph.co.uk. ^ "Munich Re concludes purchase of Hartford Steam Boiler" (PDF). Archived from the original (PDF) on October 4, 2011. Retrieved May 13, 2017. ^ Lifsher, Marc (April 17, 2009). "AIG selling 21st Century Insurance to Farmers Insurance". Los Angeles Times. Retrieved February 6, 2013. ^ "AIG confirms sale of Transatlantic Re shares". postonline.co.uk. ^ Carew, Rick (September 7, 2009). "Li Is Back In Game With AIG Purchase". The Wall Street Journal. Retrieved July 11, 2011. ^ Ellis, Blake (March 8, 2010). "AIG in $15.5 billion unit sale to MetLife". CNNMoney. Retrieved February 6, 2013. ^ Son, Hugh (March 29, 2010). "AIG Completes Sale of PineBridge Investments to Pacific Century". Bloomberg. Retrieved July 11, 2011. ^ "Update: American General Finance sold to Fortress Investment Group " Evansville Courier & Press". Courierpress.com. Retrieved December 16, 2013. ^ a b "AIG to sell Star, Edison to Prudential". MarketWatch. Retrieved July 11, 2011. ^ Bernard, Stephen (November 1, 2010). "AIG set to repay $37 billion in bailout money". Washington Times. Retrieved February 6, 2013. ^ a b Scism, Leslie; Maremont, Mark (October 5, 2010). "Judge Allows 'Death Bet' Case". Wall Street Journal. ^ a b McLaughlin, Kathleen (June 25, 2011). "Tomisue Hilbert settles suit over $15M policy". Indianapolis Business Journal. Retrieved March 20, 2018. ^ Wassener, Bettina (January 12, 2011). "A.I.G. to Sell Taiwan Unit for $2.16 Billion". The New York Times. Retrieved February 6, 2013. ^ "AIG Posts Loss on Writedowns Tied to AIA, Mortgage Declines". November 4, 2011. ^ Buhayar, Noah (May 7, 2012). "U.S. Treasury Sells $5.8 Billion of AIG Stock". Bloomberg. Retrieved February 6, 2013. 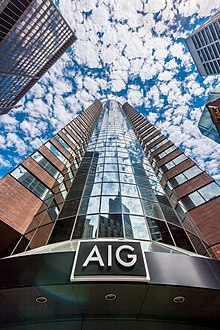 ^ "AIG to sell $2 billion in AIA shares, repay US government". New York Post. September 6, 2012. Retrieved February 6, 2013. ^ Tara LaCapra, Lauren (September 11, 2012). "Treasury sells big chunk of AIG stock at a profit". Reuters. Retrieved February 6, 2013. ^ Baynes, Dan (October 12, 2012). "AIG Sponsors Jersey of Rugby World Champion All Blacks Team". Bloomberg. Retrieved February 27, 2014. ^ "Investment in AIG". US Department of Treasury. Retrieved February 5, 2013. ^ "AIG Chief Is Being Treated for Cancer". Wall Street Journal. October 26, 2010. Retrieved March 20, 2018. ^ "Charlie Rose Talks to AIG Chief Robert Benmosche". Bloomberg. Retrieved March 20, 2018. ^ Irwin, Neil (December 31, 2012). "AIG to America: Thanks, guys!". The Washington Post. Retrieved June 4, 2013. ^ a b Russolillo, Steven (June 10, 2014). "Meet Peter Hancock, AIG's New CEO". WSJ. Retrieved March 20, 2018. ^ Kandell, Jonathan (February 27, 2015). "Robert Benmosche, Rescuer of A.I.G. After Bailout, Dies at 70". The New York Times. Retrieved March 20, 2018. ^ Emily Chan (June 11, 2015). "Nan Shan Life to buy part of AIG's Taiwan unit for $158 mln". Reuters. Retrieved June 11, 2015. ^ Nasr, Reem (November 23, 2015). "Carl Icahn turns up the pressure on AIG". CNBC. Retrieved March 20, 2018. ^ "Corporate giant AIG to begin spinoff of Greensboro's United Guaranty". News & Record. January 26, 2016. Retrieved February 24, 2016. ^ Basak, Sonali (March 10, 2017). "How AIG CEO Hancock Ended Up on Way Out". Insurance Journal. Retrieved March 20, 2018. ^ Basak, Sonali (April 26, 2016). "AIG to Join Two Sigma, Duperreault in Technology Venture". Bloomberg. Retrieved May 7, 2016. ^ Scism, Leslie; Lublin, Joann S. (August 16, 2016). "AIG Reaches Deal to Sell Mortgage-Insurance Unit to Arch Capital for About $3.4 Billion". The Wall Street Journal. ISSN 0099-9660. Retrieved August 18, 2016. ^ "History of American General Life Companies". AIGAG.com. Archived from the original on July 7, 2011. Retrieved July 11, 2011. ^ a b "AIG 2012 Annual Report 10-K" (PDF). American International Group. Retrieved October 14, 2013. ^ Ng, Serena (June 28, 2012). "AIG Brand Revived". The Wall Street Journal. Retrieved October 14, 2013. ^ a b c d e f g h i "2016 10-K" (PDF). AIG.com. p. 143. Retrieved March 3, 2017. ^ Zeitlin, Matthew. "John Stewart to Former AIG Chief Hank Greenberg: "Go F*ck Yourself!"". Buzzfeed. Retrieved February 5, 2016. ^ "As public fumes, AIG says will not sue US over bailout". Reuters. Archived from the original on February 17, 2013. Retrieved February 6, 2013. ^ Scism, Leslie. "Closing Arguments Loom in AIG Bailout Trial". The Wall Street Journal. Retrieved February 5, 2016. ^ Recent Cases: Court of Federal Claims Holds that Government Acquisition of Equity Share in AIG Effected an Illegal Exaction, 129 Harv. L. Rev. 859 (2016). ^ Sorkin, Andrew (June 15, 2015). "In A.I.G. Case, Surprise Ruling That Could End All Bailouts". The New York Times. The New York Times Company. Retrieved June 16, 2015. ^ "Greenberg's Starr to Appeal AIG Bailout Case to Supreme Court". Insurance Journal. May 10, 2017. ^ Stempel, Jonathan (January 12, 2013). "AIG Sues The New York Fed". Business Insider. Retrieved April 18, 2018. ^ a b Stempel, Jonathan. "AIG drops a lawsuit versus New York Fed related to bailout". Reuters. Retrieved December 16, 2013. ^ Freifeld, Karen. "BofA pays AIG $650 million to settle mortgage disputes". Reuters. Retrieved May 3, 2018. ^ "Board of Directors". Archived from the original on September 11, 2017. Retrieved January 23, 2018. Angelides, Phil (2011). Financial Crisis Inquiry Report. DIANE Publishing. ISBN 978-1-4379-8072-1. Cunningham, Lawrence A.; Greenberg, Maurice R. (2013). The AIG story. Hoboken, N.J.: John Wiley & Sons. ISBN 978-1118345870. Marsh, Bill (September 28, 2008). "A Tally of Federal Rescues". The New York Times. Archived from the original on October 1, 2008. Retrieved September 28, 2008. Boyd, Roddy (2011). Fatal Risk: A Cautionary Tale of AIG's Corporate Suicide. Hoboken, NJ: Wiley. ISBN 978-0-470-88980-0. Shelp, Ron (2006). Fallen Giant: The Amazing Story of Hank Greenberg and the History of AIG. Hoboken, NJ: Wiley. ISBN 0-471-91696-X. Wikimedia Commons has media related to American International Group.